If you study the information below, either in the order the categories appear, or according to your own interests, you should be able to begin experimenting with making and altering your own glazes. choose the right glaze for your work. alter glazes to suit your work. appreciate the subtleties of glazes and glazing techniques. Alkali—the opposite of acid, another term for flux. The stronger alkalis are lithia, soda, and potash; the weaker are called alkaline earths, and include magnesia, calcia, strontia, baria, zinc and lead oxide. Amphoteric—an intermediate oxide able to act as either an acid or alkali, which acts as a stablizing link between fluxes. Alumina is the most important; others common ones are boric oxide, red iron oxide, the opacifiesr titania, zirconia, and stannic oxide. Eutectic—the lowest point at which a mixture of 2 or more substances will melt, which is lower than the melting point of any one of the substances alone. The eutectic varies with each combination of materials. 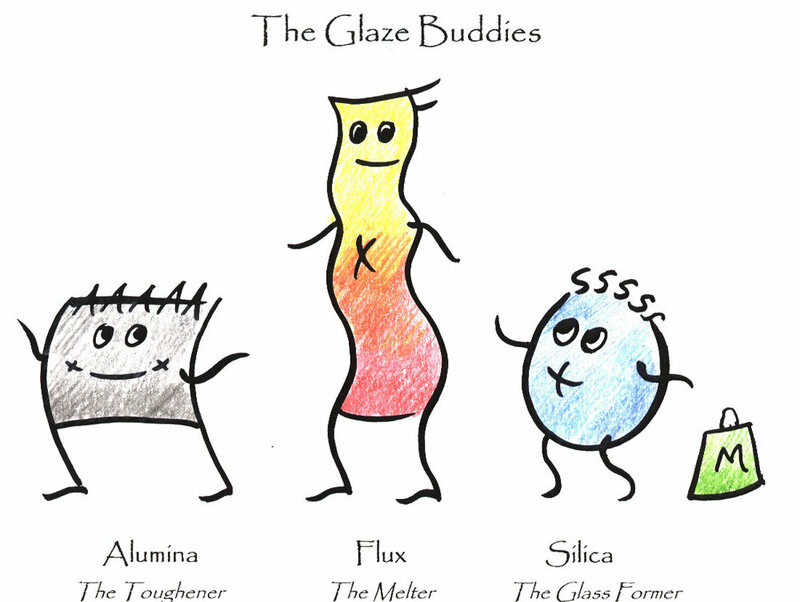 Flux—a glaze material that lowers the melting point and promotes fusion of different materials in a glaze. lower the risk of coming into contact with caustic or toxic materials. Opacifier—a mineral added to a glaze that makes it opaque, either by creating a structure of tiny crystals that deflects light, or remaining suspended and causing light interference, or causing minute bubbles that interfere with light passage. Oxide—a chemical combination (of atoms) of an element with oxygen. Reticulation—a glaze surface created during firing when one glaze bubbles up through the glaze over it to create rings of color, or a crater-like texture. Alkaline Glazes—are characterized by bright turquoise blue from copper, pink from cobalt, and blue from iron, typical of early Egyptian and Persian earthenware pottery. The glaze is dominated by fluxes such as lithia, soda, potash, and baria, but low in amphoteric fluxes. Boric oxide is usually added to lower the rate of crazing of these brittle an unstable glazes that are not appropriate for food containers. Crystalline Glaze—large snowflake—like crystals can be encouraged to form by extremely careful control of the firing and cooling cycle. Reduce the alumina conten, use zinc oxide, Borax, sodium, potassium, rutile, or rion. Glazes run, so pieces should be fired on supports over saucers. Glossy —hard, reflective surface which may be opaque to clear. Mat / Matte—non-glossy finish due to the glaze composition. Barium (toxic) or alumina plus slow cooling help form mattes. Opaque—light can not pass through. Refractory—the quality of being resistant to the effects of high temperatures. Vitreous—the quality of being hard, glossy, and non-absorbent. Characteristics of color, durablity, etc. Fluxes: Borax, Gerstley Borate, Colemanite, Lead, or Strontium. Luster—a thin film of metallic salts that are reduced either by the medium that holds them when being painted on, or introduced in the very low temperature firing. It is usually applied to an already glazed surface. Majolica (maiolica)—traditionally an opaque tin-based glaze with very colorful painted designs. It began on the island of Majorca in Spain, and then was adopted by Italy. Also called Faience for Italian city where it thrived. Raku—a firing process that usually includes post-firing reduction to alter the soft glazes with an exaggerated crackle, metallic luster, or opalescent effect. Terra Sigillata—a very soft slip glaze originated by the ancient Greeks. Underglaze—oxides or commercial glazes or stains, painted under the glaze layer before firing. Fluxes: Some low-fire flux is substituted for high-fire fluxes. Many potters use this range because it produces some of the benefits of the stoneware range, but also allows a wider range of color. A second, and great, benefit is that many people find electric kilns more easily available and economical to use. Electric kilns normally do not fire above cone 6-8, and have an oxidation atmosphere. Even without the glaze effects possible with reduction in a gas kiln, the mid-range is an excellent alternative firing range. Feldspars, etc. Go to The Flux Pool for a list. Celadon—a transluscent glaze first developed in China to imitate the color of jade, from the colorant iron. Chun—a pale blue opalescent glaze developed in China, made in low alumina wood ash and feldspar glazes with small percents of iron and copper. Copper Red(sang de bœuf, flambé)—an oxblood red created with a small percent of copper in certain reduction glazes. Crystalline Glaze—snowflake-like crystals can form in certain low alumina glazes with careful heating and cooling. Glazes often run and should be fired on stilts over a saucer. Salt or Soda Vapor Glaze—salt is introduced into a hot kiln causing it to vaporize. The sodium attaches to the silica in the unglazed clay body creating a glaze, often with an orange peel textured surface. Shino—an almost purely feldspathic white, pale iron red, gray, or marbelized glaze first produced in the Mino kilns in Japan, in 1580. It has a thick, very slightly transluscent surface that is desirable in Japanese tea ceremony bowls. Slip Glaze (vitreous engobe)—a glaze that contains a large percentage of clay. The advantage is that it may be applied to greenware rather than bisque to eliminate one firing. Tenmoku (temmoku)—a rich dark glossy iron-saturated glaze developed in China and Japan. Roll out a large slab no thinner than 3/8, up to 1/2 " thick. Cut out 4 x 6" tiles. Make a shallow groove about 1 1/2" up from the bottom, completely across the tile to catch the glaze if it runs during firing. The tiles should be glaze-fired vertically. Leave a smooth area across the the upper part of the tile, and make a horizontal band of texture so that you see how the glaze looks on both types of surfaces. It may be useful to also add a band of white or dark slip. Dry the tiles between layers of newspaper, and turn them over occasionally, to prevent them from curling up at the corners. Paint one line of each of the 3 main colorants (cobalt, copper and iron) mixed with water or commercial underglazes to test their reaction with the glaze. Brush or dip glaze over the area above the shallow groove (one layer on left side, 2 layers on the right); wipe glaze off the edges and back of tile so that it can be fired vertically, leaning against a kiln post. It is useful to write the complete glaze formula and temperature (with iron oxide in water and a fine brush) on the back of each tile for future reference. Wear an approved dust mask or respirator. Use one container with snap-on lid for each test. Label each container with its contents. Prepare your clean bisque tiles with colorant lines. If the tiles are dusty, they may be rinsed in water and allowed to dry. Then draw one thin horizontal line in each of the 3 coloring oxide solutions*, across the tile just above the groove. 1 tsp. colorant + 1 tsp. Gerstley Borate/Frit #3124. 75% Frit #3124 + 25% colorant, + 1Tbsp liquid laundry starch. Weigh out the ingredients in your recipe. Leave the dry material containers in their order on the counter. Do not take them to another table. TIP: To make 3 tests of the same base more accurate and less time consuming, line up 3 containers and weigh the 1st ingredient 3 times, then the 2nd 3 times, etc. Weigh out glazes very carefully. Check off each amount in the formula as you weigh it, because the oxides look alike and you can easily loose track of what you are doing. If you spill, use a wet sponge to clean up. First, why would you want to do that? Glaze recipes/formulas are often written so that the base ingredients total 100, which means the parts represent a percent of the whole. If all glazes are written this way, it is easier to compare the ingredients if you are looking for a particular effect from certain fluxes, etc. If a glaze base does not add up to 100, below are 2 ways to change the numbers and still keep the ingredients in the correct proportion. If your math is correct, the new total should be 100. The simplest way: Divide each ingredient amount by the total. Ingredient C . . . . . 12 ÷ 118 = 10. How much dry material does it take to make a 5 gallon glaze bucket of liquid glaze? Potters often use 5 gallon buckets to hold liquid glazes they make themselves. It's best if buckets are only 3/4 full to allow space for displacement when work is dipped into the glaze. Here are useful facts to know. 1 pint = 1 pound "the world around"
40 lbs x 3/4 full = 30 lbs liquid glaze needed. 15 lbs dry glaze is needed. to fill a 5 gal bucket 3/4 full. About 6,800 grams of dry glaze materials makes a good amount for a 5 gal bucket. How would you compare costs of commercial glazes to those you make yourself? 1 average glaze batch is 6,800 grams / 15 pounds. Dry materials are ordered more economically in 25-40 pound bags. You will probably use the most common ones in different proportions in more than one glaze.